I was told to introduce myself since some of you might not know me yet. My name is Hilda Bjorn, Bjorn with a J. My mother told me, when I married my late husband, that it means “bear.” He wasn’t one, though, unless you count a Teddy Bear. But that’s not important. He’s been gone so long I wouldn’t remember what he looks like without the pictures. And I can’t see the pictures without my wire-rim glasses. Now, where are...oh, here they are, on my head. Anyway, what I—Oh, look! Here comes that darling cat. Come here, Quincy. He loves rocking with me on my front porch. Isn’t he darling? You wait a minute, Quincy, I’ll be right back. I’m going to get him some crumbs from that last batch of Raspberry Chiffon dessert bars I bought at the Bar None. That’s where the nice lady works who owns Quincy. He’s always getting away and he loves to come see me. There, see how much he enjoys this treat? I do, too, and neither one of us should be eating it, I suppose. I’ve got that diabetes stuff, but I’ll just do my pump. Back to what I was saying. My eyes aren’t what they used to be. That nice lady, Julie Larson—she’s the one who put that bad man in jail and she’s also a friend of Chase, Quincy’s owner—gave me a book that other day and it was large print. I’m going to look for more of those. It’s just the thing for my old eyes. I set it down right…now, where did I put it? I’ll find it after Quincy goes home. His owner will be along soon. I think that’s her running up the sidewalk now. Quincy, let’s brush these crumbs away so she won’t know. It’s me, Janet, the author. 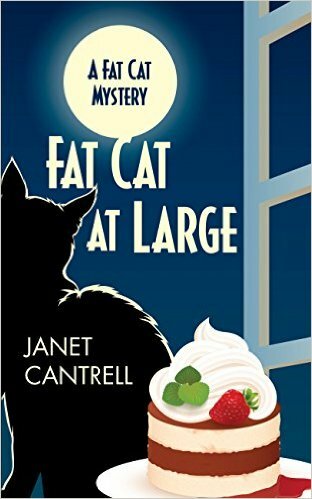 I have one copy of the first book in the series, FAT CAT AT LARGE, in large print to give away. Please either leave your email below or message me with it. I’ll pick a winner next Friday and mail it to you! I love large print books, and the cover is cute. Thank you for the giveaway. I would love to have a large print copy of this book—thanks for the chance to win one! erika@booksthething.com - thanks for the chance! Always up for a new "cozy" and large print is easier on "old" eyes. That is a wonderful cover. The older I get, the larger I like the print. Thanks for a chance to win this. Would love to win a copy of the book. Thanks for the chance. Large print is wonderful. Thanks for the chance. I'm a cozy addict and always on the lookout for a new series. This sounds so fun and I love a cozy with fur babies in it:) Thanks for a chance to win your large print edition. Large print is great. Thanks for the chance to win. This is a great series and I can't wait for Book#3. I love large print books & think Fat Cat at Large is the book for me. After reading/reviewing it, I'll add it to the large print collection at the library where I work. 59-69% of Our patrons are elderly & need large print for reading. Thanks for the chance. MsKayLib at gmail dot com. Hilda sounds like quite a character! Thank you Janet for the chance to win the debut book in your series! Large print books are sometimes hard to find and older people like me really enjoy it being a little easier on the eyes. Of course with cozy mysteries, I don't really think about that too often. Thanks for this opportunity. I would love to get a large print edition. Thanks for the chance. I need to read this book, and I sure appreciate the large print version :) Thanks a bunch for the chance to win! Love Fat Cat! Thanks for the chance to win. Would love to read this book and especially in the large print! By the end of the day my eyes are tired and reading paper books can be harder when the print is so small. Thanks for the chance! I love it when I read something in the voice of a book character. It kind of bridges the gorge between their reality and mine. I think Hilda is a hoot and I'd bring her over Raspberry Chiffon bars (sugar-free, unbeknownst to her, so she could be around to chat with for a long time). luann(dot)braley(at)gmail(dot)com. This sounds like a book I would love to read. I NEED large print. Sadly. I love to read real books. I realize that the size of text on electronic books can be adjusted, but I would still rather hold a book in my hands than a tablet. How wonderful! I have the book and have read it. Loved it! If I win I'll donate mine the local veterans homes. They can only receive large print. I have noticed that the large print books are great to take to the gym. Thanks for the chance. Cut cover. These days, large print is much easier to read. I must see the eye doctor soon. Thanks for the chance. I'm late getting here today. I think my bronchitis took a break and then decided to come back. Ugh. I just picked a number between 1 and 53 with Random.org. That's how many entered for this copy, including here, email, and fb messages--thanks for so much interest! The winner is Sheryl Booth, who messaged me on facebook. For the rest of you wonderful people, the large print IS available for purchase at Amazon (http://www.amazon.com/Fat-Cat-At-Large-Mystery/dp/1410478262/ref=tmm_pap_title_0?_encoding=UTF8&qid=&sr=) and BAM (http://www.booksamillion.com/search?id=6148733913259&query=fat+cat+at+large&where=All). I can't find it at B&N, but it's probably there somewhere. THANKS VERY MUCH!